CarGurus has 26,868 nationwide Grand Caravan listings starting at $1,499. The 2009 Dodge Grand Caravan maintains its tradition of safe, comfortable, reasonably reliable, and value-laden family transportation. Less-powerful engines and lackluster interior materials and workmanship place the '09 Grand Caravan in the middle of a market it could easily dominate. 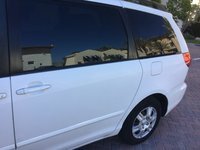 Although reviews of the 2009 Dodge Grand Caravan vary widely on a number of issues, the bottom line is that it's a safe and reliable minivan that packs a ton of standard features in addition to a warranty that’s second to none. Despite an aging exterior design, Dodge has a proven performer in the ’09 Grand Caravan. The 2009 Dodge Grand Caravan (along with its Chrysler sibling, the Town & Country), though arguably outclassed by the Honda Odyssey, Toyota Sienna, and Hyundai Entourage, still offers a vanload of value. Three trim levels, the C/V (Cargo Van), SE, and SXT are offered for the Grand Caravan in ’09. Imaginative rear seating configurations, outstanding roominess – over 141 cubic feet of cargo space with the second- and third-row seats folded flat - and the optional 4.0-liter V6 offset the boxy exterior, lazy 3.3-liter V6, and questionable interior materials and workmanship that some reviewers mention. After a significant redesign in 2008 that included updated sheet metal, interiors, and powertrains, Dodge’s Grand Caravan benefits from a few additional changes in ’09. These include more standard features for the base C/V and SE trims and a few more options for the high-end SXT. In addition, each of the Grand Caravan trims have better brakes for ’09, and SXT owners who opt for the 4.0-liter engine will get a Euro-style sport-tuned suspension. Though some professional reviewers are unwilling to recommend the ’09 Dodge Grand Caravan, most position it among the top minivans on the market. ConsumerGuide Auto pegs both the ’09 Grand Caravan and Chrysler’s Town & Country among its selections for a “Best Buy,” and The Car Connection rates the ’09 Grand Caravan second in its six “Best-Bang-For-The-Buck” vehicles. 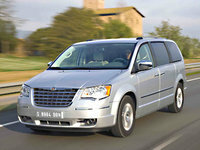 Car and Driver Magazine rates the ’09 Dodge Caravan third in a field of five popular models. The base C/V and SE Grand Caravan trims for 2009 pack a standard 3.3-liter OHV V6 that ekes out 175 hp at 5,000 RPM and 205 lb-ft of torque at 4,000 RPM. 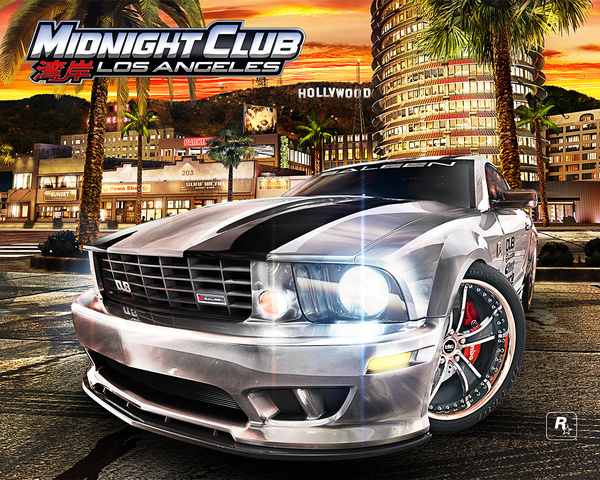 A four-speed automatic transmission is standard with the 3.3-liter, allowing it an EPA-estimated 17/24 mpg. 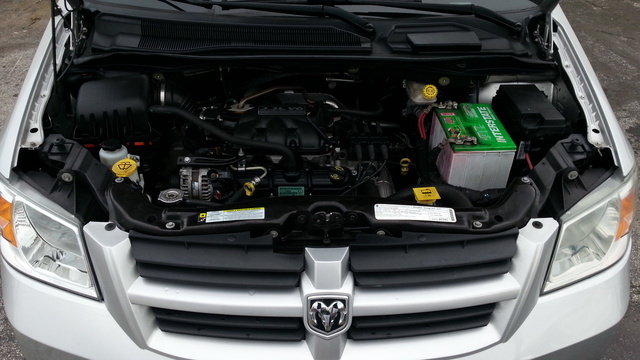 Reviewers have noted that the 3.3-liter engine has problems merging and passing on the highway; this is not surprising, considering the Grand Caravan's 4,300-pound frame. The top-end Grand Caravan SXT trim for ’09 features a standard Flex Fuel 3.8-liter OHV V6 that, mated with a six-speed automatic, grinds out 197 hp at 5,000 RPM and 230 lb-ft of torque at 4,000 RPM. The EPA estimates mileage at 17/25 for the 3.8-liter V6, which runs equally well on regular gasoline or ethanol-based fuel. Professional reviewers rate the 3.8-liter V6 as fine around town and a bit better on the highway than the 3.3-liter engine. Optional for the 2009 Grand Caravan SXT is a 4.0-liter V6 reviewers feel is a far more suitable powerplant for such a heavy vehicle. With the standard six-peed automatic transmission, the 4.0-liter V6 pounds out 251 hp at 5,000 RPM and 259 lb-ft of torque at 4,100 RPM with EPA estimates of 16/23. Though happier with the 4.0-liter V6, many professional reviewers find the best Toyota, Honda, and Nissan motors are measurably superior in power and acceleration to the Grand Caravan's. The 2009 Dodge Grand Caravan features a front independent suspension with modified MacPherson struts and a front stabilizer bar. A solid-axle rear suspension supports the Grand Caravan's hefty body and allows a towing capacity of up to 3,600 pounds when properly equipped. The Grand Caravan SXT with the optional 4.0-liter V6 is delivered with a Euro-style sport-tuned suspension that's been tweaked for 2009. Most reviewers and virtually all owners find the Grand Caravan to ride reasonably smoothly and, above all, quietly. Reviewers also find the Grand Caravan to have a surprisingly tight turning radius, though nearly all note pronounced lean in hard cornering. The 4.0-liter-equipped SXT, with its stiffer suspension, isn’t quite so forgiving of bumpy roads and rides a bit more noisily, but it corners and handles considerably better than trims with the standard suspension package. All ’09 Grand Caravans are delivered with 16-inch wheels (steel for the SE trim and alloy for the SXT) and four-wheel power disc brakes. For the SXT trim level, 17-inch aluminum wheels are an available option. Almost all professional reviewers find the cabin materials on the 2009 Grand Caravan below par - indeed, by one account, downright “shoddy.” Nearly all reviewers, however, find the gauges on the ’09 Grand Caravan large and easy to read, controls well-marked and reasonably accessible, and standard features plentiful. A few professional reviewers also find the cabin of the 2009 Grand Caravan among the quietest in its class, though one notes some marginally intrusive engine noise with the 4.0-liter V6 when accelerating. For 2009, the Grand Caravan C/V and SE trims offer such standard comfort and convenience features as front cloth bucket seats, air-conditioning, cruise control, power windows and door locks, power heated outside mirrors, remote keyless entry, Stow ‘n’ Go second-row seating (in the SE), tilt-wheel steering, and a single-disc, MP3-compatible CD player, with two speakers in the C/V trim and four in the SE. Options for the ’09 C/V and SE trims are numerous and, as is common with Dodge, convoluted. Depending on the package selected, options for the C/V and SE can include the ParkView backup camera system, power-sliding doors and liftgate, an auto-dimming rearview mirror with Bluetooth enabled, UConnect hands-free communications technology, a hard-drive navigation system with SIRIUS satellite radio, a CD/DVD player, and a roof rack. Options for the SE trim only include three-zone temperature control, rear-seat single-screen DVD entertainment, an outside temperature display, Swivel ‘n’ Go second-row seating, power-adjustable pedals, remote start, and Easy Clean stain-resistant fabric. The ’09 Grand Caravan SXT offers such additional standard features as alloy wheels, steering-wheel-mounted audio and cruise control buttons, three rows of cupholders, driver and passenger one-touch power windows, a universal garage door opener, an overhead console with storage space, and SIRIUS satellite radio with 12 months of service included. Options for the Grand Caravan SXT include the 4.0-liter V6 with six-speed automatic and sport-tuned suspension, 17-inch aluminum wheels, three-zone automatic temperature control, the Cross Path rear detection system, SIRIUS back-seat TV, second- and third-row 9-inch DVD/TV screens, leather upholstery, a vehicle information center, the MyGIG infotainment system, a power sunroof, body-color running boards, a trailer-tow package, and a 506-watt audio system with nine speakers and a subwoofer. In keeping with its image as a family friendly wagon, the 2009 Dodge Grand Caravan has impressed both owners and reviewers with its numerous and comprehensive standard safety features. Such features include four-wheel disc ABS with brake assist, Electronic Stability Control (ESP), traction control, next-generation dual front airbags, front-seat-mounted side-impact airbags, supplemental side-curtain airbags, seatbelt pre-tensioners, side-door beams, a reinforced roof, and a tire pressure monitoring system. Optional safety features for the ’09 Grand Caravan include the ParkSense and ParkView rear backup systems and integrated child safety seats. The Dodge Grand Caravan scored five stars in National Highway Traffic Safety Administration (NHTSA) front and side impact testing and four stars in rollover tests, while the Insurance Institute for Highway Safety (IIHS) gives the ’09 Grand Caravan its best rating of Good in front and side impact tests. Owners are well-satisfied with the 2009 Dodge Grand Caravan. Nearly all owners mention that this versatile minivan has wooed them from their gas-hungry SUVs and just-plain-too-small crossovers. Complaints were few by owners of the ’09 Grand Caravan, with most involving the tight fit for adults in the third row, difficulty with stowing the second-row Stow ‘n’ Go seating, and the fact that the front seats have to be moved all the way forward to fold the Stow ‘n’ Go seating flat into the floor. One owner did mention an issue with brake noises as well. Interestingly, few owners mention the Grand Caravan's exterior styling, ordinarily a huge point-getter for Dodge and Chrysler vehicles. A Lifetime Limited Warranty, roominess, comfort, gas mileage, a smooth ride, effortless acceleration (at least with the 4.0-liter engine), and options such as the Cross Path, ParkSense, and ParkView backup systems and family-friendly rear-seat entertainment systems mean, in a word, value. This is true for virtually all owners of the 2009 Dodge Grand Caravan. What's your take on the 2009 Dodge Grand Caravan? Users ranked 2009 Dodge Grand Caravan against other cars which they drove/owned. Each ranking was based on 9 categories. Here is the summary of top rankings. Have you driven a 2009 Dodge Grand Caravan? 2009 grand caravan stalls out while driving. It will start backup but is dangerous?